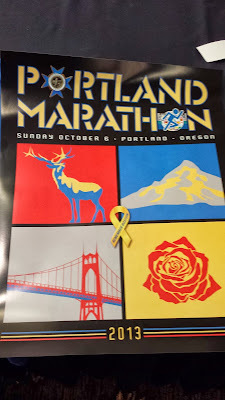 I know I'd said that I probably wasn't going to write a post today, but I am so nervous about tomorrow that I thought I just needed to talk things out, plus I picked up my packet last night and took tons of pictures! The packet pickup was at the Hilton in Portland, so we just zipped down after work. 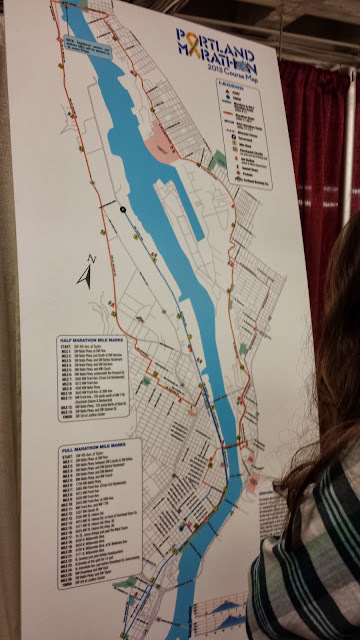 The ordeal of getting into the bowels of the hotel to the Expo part was comedy gold, I mean, it literally took a good 7 minutes of going down random stairs, hallways and roped off places to get to where I was supposed to get my bib. Eric and I just kept looking at each other and laughing every time we had to turn in yet another direction. 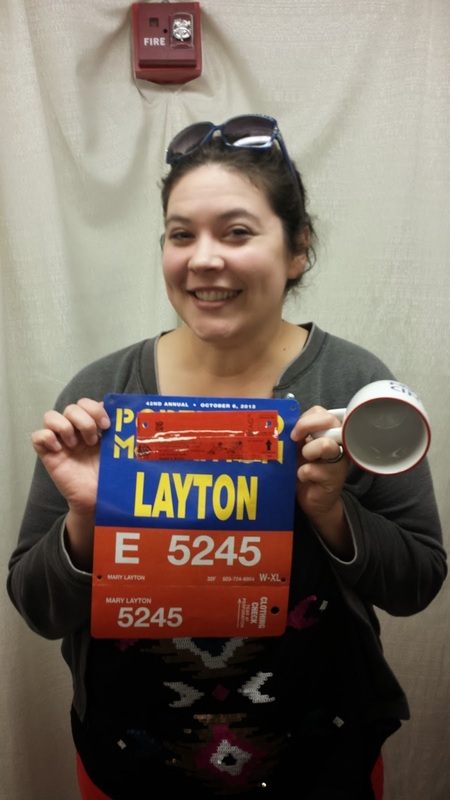 The second I was handed my bib, my stomach dropped. I literally felt a surge of terror unlike anything I have ever felt. It made everything real. My next moment of terror is going to be making sure that I get my chip thingy (that red strip) on my shoe right. A very nice volunteer took me through how to do it, but I'm sure I'll be freaking out tomorrow and forget. There's a lot of "pull this tab off, fold this, thread this through your shoe, etc" drama, and for someone who can't handle saran wrap without a level 5 cussing fit, I'm sure it's going to be good times. I absolutely love the tech shirts we got for the marathon. I love the blue, the logo, and the Remember Boston logo is a classy touch. People may not know this, but Portland's name was decided in 1845 by a coin flip. The other name that our city could have been called? You got it, Boston. You can read more about it here on my friend Wikipedia, it's a really interesting story. The coin used in the flip is at the Oregon Historical Society, and we got to see it a couple of years ago on a walking tour. So cool. 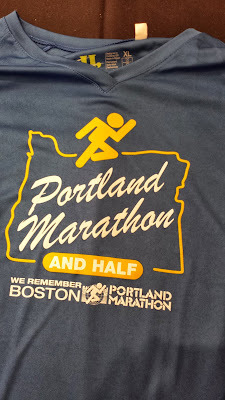 The romantic and the history lover in me loves having Portland and Boston's names on the same shirt. 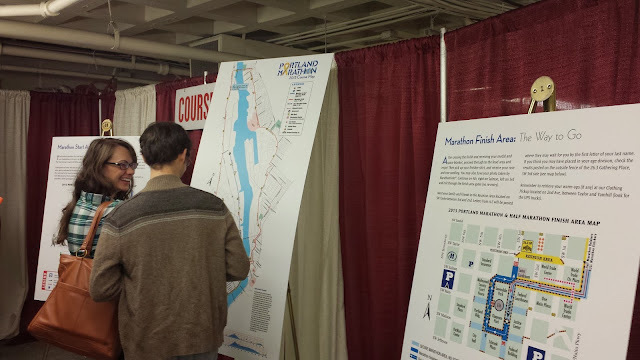 The next thing that was making me have a panic attack was seeing the course maps blown up to my size. Nothing like seeing your future pain on a giant poster board! My other piece of swag was a cool poster. It's simple, beautiful and very Portland. The top left panel is a replica of the Thompson Elk statue in downtown Portland. Top right panel is Mt. Hood, one of the most beautiful places in Oregon. Bottom left is the St. Johns bridge, which is part of the marathon route and is stunningly pretty. 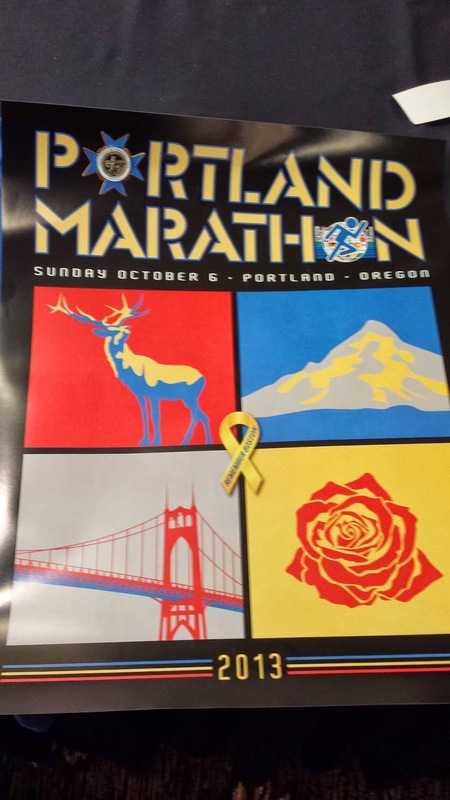 And of course bottom right is an homage to our nickname, The City of Roses. And you can't see really, but the ribbon in the middle says "Remember Boston". I definitely want to get this framed! I've been taking it easy today, but am freaking out a bit for the obvious reasons, but also because I am getting sick. I felt it coming on last night, and have felt like crap all day today. My teeth have hurt all day, which usually means I'm going to get majorly sick. Nothing to do about it now, other than try to rest, get enough fluids, and hope that it can hold off for one more day. Okay, that comment about Saran wrap had me laughing out loud. I am so glad I found your blog thru Runs for Cookies. Your writing is hilarious. Aww thanks for commenting! So happy you found the blog, I hope you enjoy! I like getting new readers!